David A. Paitson, a marketing professional with more than 20 years general management and executive experience with successful major and minor league sports franchises, will be Sam Houston State's new associate athletic director for external operations, Bearkat director of athletics Bobby Williams announced Thursday. The Terre Haute, IN, native has worked for professional teams including the Columbus Blue Jackets, Indiana Pacers and Columbus Chill. Most recently, as vice president of ticket sales for the Blue Jackets, he lead a team of 40 responsible for $37 million in annual ticket sales representing two-thirds of the National Hockey League franchise's overall operating income. "Bringing David Paitson to Huntsville to oversee our development and marketing efforts is a major step forward in our efforts to enhance Sam Houston State's Division I future," Williams said. "David is a visionary leader who has played instrumental roles in successfully establishing or reviving six unique sports businesses. To fill our athletic development position, we were looking for someone who will bring fresh ideas not normally found in a collegiate setting. We're excited to have him join us as Sam Houston begins its new Bearkat Champions Fund campaign." The Bearkat Champions Fund is an all-inclusive marketing and fundraising opportunity kicking off this fall to enhance the goal of current successes of the fiend and in the classroom by the Sam Houston department of athletics. 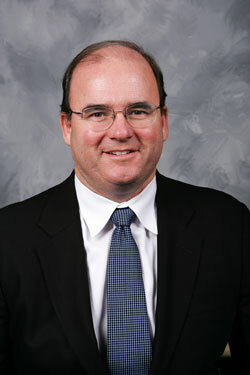 Paitson served on the Blue Jackets staff for 10 years, working first as vice president of marketing before moving into ticket sales in 2006. During his tenure the Blue Jackets were voted by ESPN as the No. 1 Stadium Experience among 121 North American professional teams. "Moving into college athletics after many years in pro sports is an exciting opportunity for me," Paitson said. "The diversity you find in a 17-sport intercollegiate program on a university campus will be a whole new world that will be fun to explore. "The resources for success at Sam Houston are there. The one thread that really impressed me is the quality of the people. From Bobby Williams, the athletic director, to the administrative staff, coaches and student-athletes, it is easy to see why the program has produced such a great streak of recent athletic successes." Paitson served as president of the Columbus Destroyers Arena Football Team from 2005 to 2006 where he executed unique marketing strategies that attracted fans and drove ticket sales for the 17,100 capacity events. As president and general manager of the Columbus Chill from 1991 to 1998, Paitson led the start-up of the East Coast Hockey League expansion team, one of the most successful in minor league history. The team maintained an 80 percent sellout level during seven seasons, setting the current minor league hockey record of 83 consecutive sellouts. The franchise earned the 1991 ADDY Best of Show and 1993 AMA's prestigious Project of the Year awards of the team's aggressive grassroots advertising campaign that quickly attracted a loyal fan base. Paitson also oversaw The Chiller Ice Rinks, a network of ice rinks across Central Ohio that generated revenues through public skating, lessons, figure skating programs and youth/adult hockey and group sales. As marketing director for the Indianapolis Ice from 1988 to 1991, he was a key contributor to establishing and building Indianapolis' first financially successful hockey franchise. From 1982 to 1988, Paitson served three years as assistant marketing director and three seasons as public relations director for the Indiana Pacers, helping revive the NBA franchise's attendance from 4,500 to more than 12,500 per event. He received his Bachelor of Arts in sports administration from Biscayne College (now St. Thomas University) in Miami, FL, in 1982. He earned his Masters of Science in marketing and communication from Franklin University in Columbus, OH, in 2003. Paitson's wife Lauren served as executive director of the national sorority Kappa Kappa Gamma. Paitson begins work at Sam Houston State on Sept. 2.